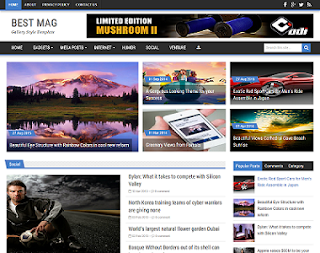 Best Mag is a 3D look theme, that is precisely use on Portal websites, Gallery, Technology or Magazine blogs. We've added post sharing button on any desired email. Best Mag is completely SEO optimized blogger template. We have injected 3D style social share buttons below post title. Best Mag has an elegant friendly layout that allows user to template's color by simply going to Blogger's Customize option. Viewer can stay longer on the site, because they can follow next and previous post titles.